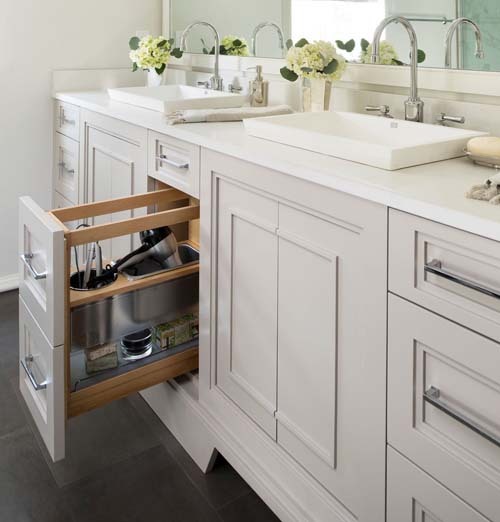 Designing your dream bathroom but forgetting one of the most important details -- storage? Or maybe you’ve just realized you need to get better organized. Rev-A-Shelf’s organizational products blend in seamlessly so that they don’t take away from your design. We’re sharing some of our favorites here. Check them out and see what works best for your storage and organizational needs. And -- good news -- most of these products are easy enough to install that you can do it yourself! Want to listen to music while getting ready but need to charge your speaker? The Charging Drawer allows you to charge it (and any other electronics) without having to leave it in another room, so no more getting ready in silence! The vanity organizers are trim-to-fit, so you can make yours the perfect size for your drawer. With the organizer, you’ll have a designated place to put everything. If you can cut it to the size of your drawer yourself, the installation is effortless! But here’s a tip from the pros: use either a table saw with a fine-cut blade with 60-80 TPI (teeth per inch) or a miter saw with a fine-cut blade that can cut 22" (or cut it in two passes). Another option is to use a jig saw with a 3-1/2"-4"-long fine-cut blade. The grooming organizer has plenty of space for your styling tools and products. Rev-A-Shelf is introducing a version with an outlet (game changer!) in fall 2019. If you’re still in the early planning stages of your bathroom remodel, this could be worth asking your cabinetmaker to include in the design. For storing products you reach for on a regular basis, we love Rev-A-Shelf’s organizational rack . This is another product you can install yourself -- all you need is a drill. This organizer fits behind your cabinet doors to hold your styling tools. It’s a good alternative to the Grooming Organizer if you need a simple fix. If you’re low on space and don’t want your scale sitting on the floor at all times, Rev-A-Shelf’s scale holder allows your scale to rest behind your cabinet door. © 2016 HGH Hardware Supply. All rights reserved.